The latest theatrical attendance analysis by the MPAA shows the Key demographics for 18 – 24 and 25 – 39 are all in decline in 2016 relative to their positions in 2012. Declines are also noted in Germany with recent research published by Filmförderunganstalt (Germany’s Film Funding Organization) where an 11% decline of the 16 to 24 year old demographic occurred between 2010 – 2017. Today’s younger audiences are busy, fragmented across devices and completely overwhelmed with online entertainment choices. They live online and so it’s important that cinemas focus on their digital experience as effectively as they have been doing with their offline, in-person experiences. 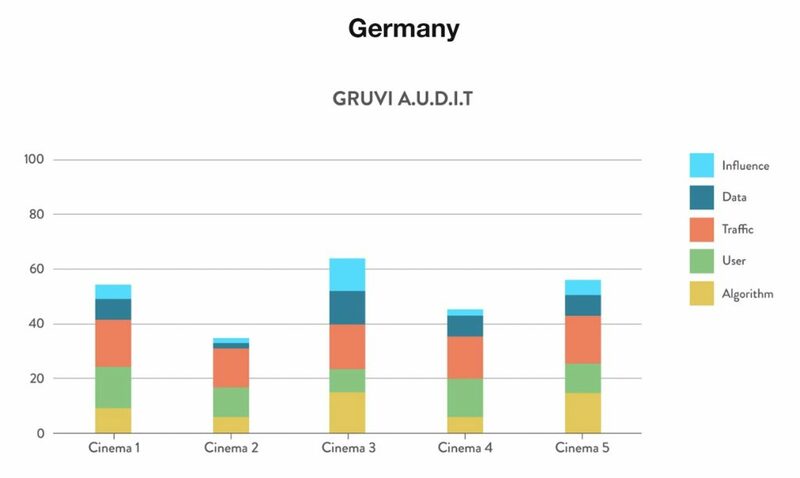 How Effectively Are European Cinemas Reaching Online Audiences? 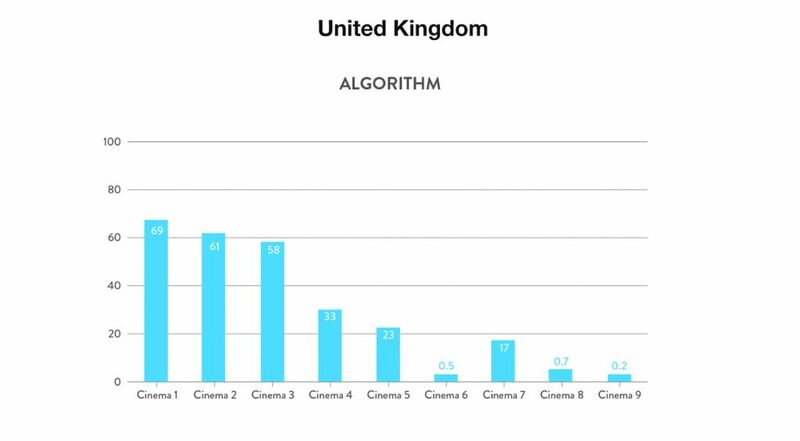 Algorithm: The Algorithm score is based on each cinemas best use of Google’s search algorithm within their page infrastructure. User: Refers to the user experience of the site and looks at factors that affect usability and user experience. Data: Shows whether the page uses state of the art AddOn integrations. AddOns provide the ability to understand audiences and track conversions. Influence: Rates social media activity and includes activities such as blogging and measures the ability and quality to create original content to attract audiences. The first part of the study will comprise of three major markets; Germany, the United Kingdom and France. Each cinema’s score is determined among its local competition. Data collection and analysis was conducted through market leading software for search engine optimization (SEO), social media and web analytics. 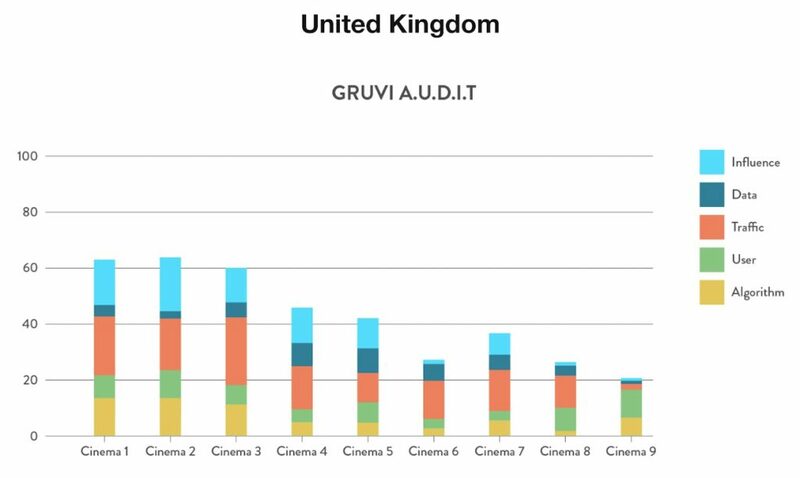 Cinema names will be kept anonymous in the analysis but should cinemas wish to understand their ranking they are welcome to reach out to ben@gruvi.tv. Cineworld, Curzon cinemas, Empire cinemas, Everyman cinemas, Odeon, Picturehouse cinemas, Reel cinemas,Showcase cinemas, Vue. The strongest outliers for working with Google algorithms were found in the UK, closely followed by cinema operators in the French and German markets. 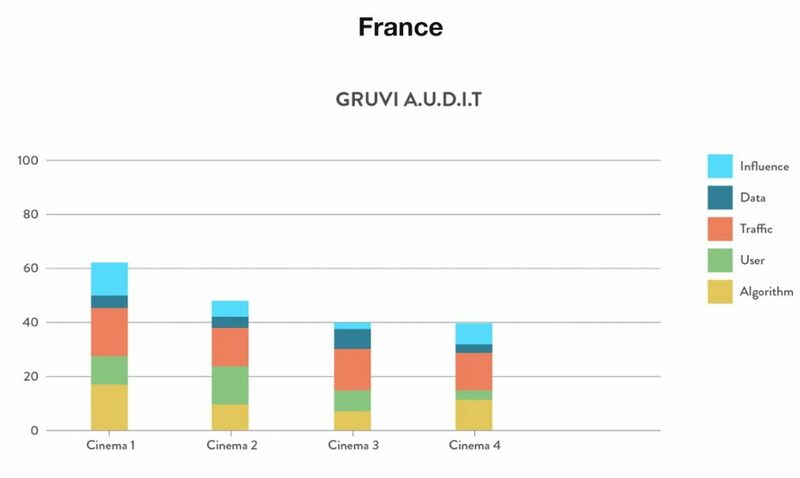 The strongest performing cinema chain was in France. Approaches to SEO and other forms of optimisation varied across the study indicating that many chains have yet to introduce a comprehensive SEO strategy. We highlight this as a major opportunity for cinemas who have not invested in SEO – but with the caveat that the process can be costly and involve significant development time. Working with various search algorithms develops free traffic from a hyper local perspective – particularly for film title related searches. It’s in a cinema’s best interest to be at the top or at least on the first page of any search results. This factor becomes especially important as trends in mobile searches continue to increase. Serendipity is the name of the game so if you are not discoverable at the right place and moment you are not in the game. Currently users are finding films at their local cinemas from movie title related searches at least 55% of the time. We recommend cinemas that have not invested in a comprehensive SEO strategy begin this important investigation as soon as possible. 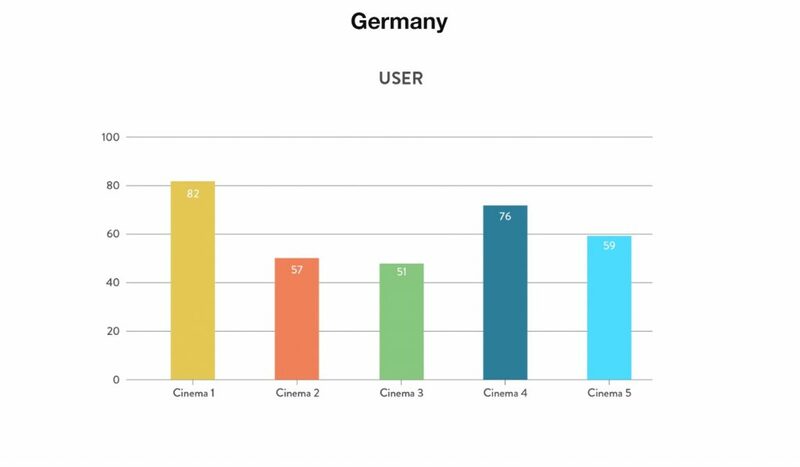 User experience across cinema chain websites was strongest in Germany and the UK. The outlier (i.e. best) cinema was in Germany. In general cinema operators performed well in providing useful information to their audiences about films, some even had advanced ticket systems that streamlined the process of booking online. Many cinemas had also made the investment into mobile apps for communication. Little attention was also placed on capturing intent for upcoming movies – with no way to register interest or trigger a reminder for films in the coming soon section. Cinemas have long way to go in terms of personalising the presentation to specific types of audience and streamlining the process to make ticket booking, registration and interest recording easier. `Anyone looking at the work of Netflix can see the massive levels of investment that go into personalisation. 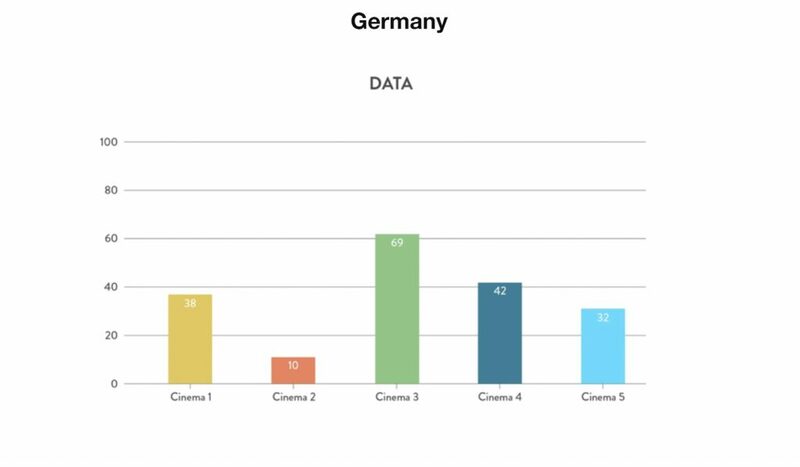 The countries where data capture routines were best integrated into the user journey were Germany and the UK with the outlier (best performing) cinema in the Germany. In order to use the full potential of the digital ecosystem and understand your audiences, website addons have become a mandatory integration for cinemas to build audience centric strategies. 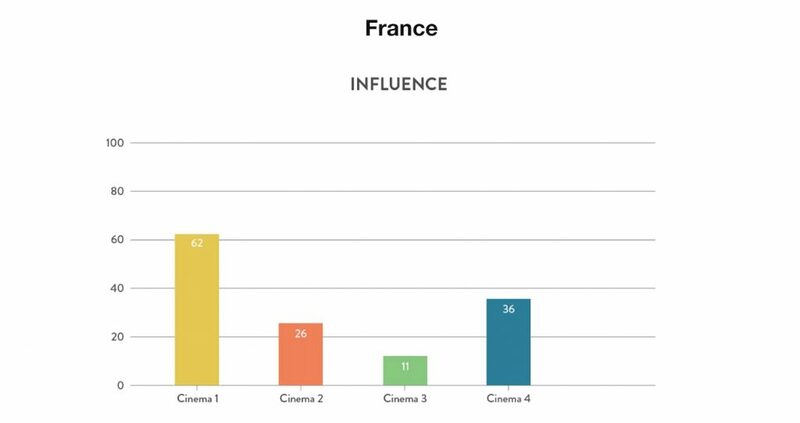 We found that measuring success of online marketing and discovering audience touch-points on cinema websites are not that widespread across all countries. Basic architecture like the institution of proper tagging for online advertising, remarketing and audience segmentation is being overlooked by most cinemas in the study. Cinema owners should be treating their locations as catchment areas for good audience data collection routines that follow the guidelines of GDPR so that they can better understand and segment their digital audiences. This understanding can lead to very interesting evaluations of the different customer segment groups, which in-turn can be used to improve many other aspects of an operator’s website such as the user experience discussed previously. Social media, if approached correctly, is a continuous source for new prospects. However it needs to be integrated into an organization’s ongoing business practice instead of being conducted in a “silo”. We found the French market made the most effort in this area. 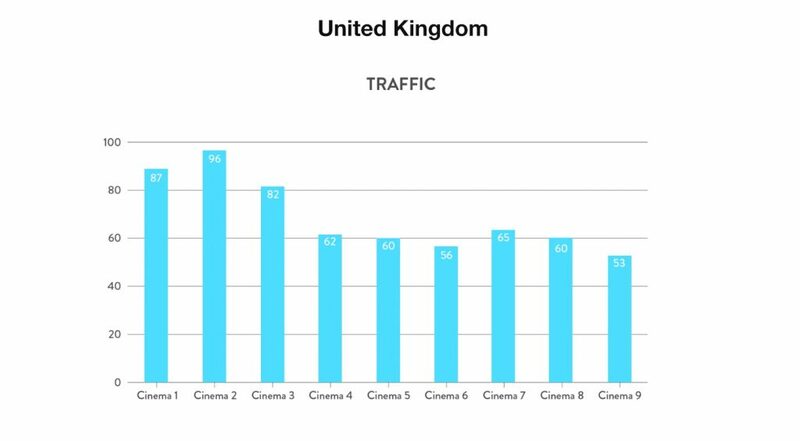 With an internet penetration rate as high as 96%, the UK’s cinema websites by far have the most traffic, however considering the population of Germany and France there is a lot more opportunity in these markets. It’s unusual for cinema chains across Europe to have a marketing department of more than a few people. There are notable exceptions to this, but traditionally marketing has been seen as the role of the distributor. Staff working in marketing departments are also stretched across a range of offline and online functions. This spread of resources limits the ability for cinema owners to invest in the granular detail that is required to build a dedicated digital strategy, particularly in the early stages. Keeping an eye on how marketing departments will change over the coming years will reflect the growing importance of this channel. Our prediction is within five years most major chains will have larger multidisciplinary teams consisting of several experts in SEO, SEM, web user interface and experience and a dedicated developer or two to help these executors function. Interesting times are ahead and the companies that invest now stand to gain the most from tomorrow’s audiences. Employ or engage a dedicated SEO specialist as part of the marketing team. Gruvi is a media tech company that specialises in working across the value chain of a film’s release. have products and services that work for producers, distributors and exhibitors. Through this experience develop an innate understanding of digital audiences and how they interact with films.